$200 Reward for Recovery of Stolen Bicycle : Lexington, KY – Where Did My Brain Go? 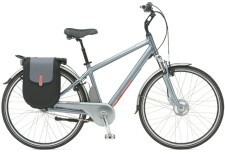 A $200 reward is offered for the return of a blue/gray Giant Cypress Hybrid bicycle, with red saddle bags, similar to the bicycle shown in adjacent photo. Bicycle was stolen today, July 21, 2009, between 3 P.M. and 7 P.M., in the Chevy Chase Ashland Park neighborhood, of Lexington, Kentucky. Stolen Grand Cypress Hybrid bicycle was on the the porch of my buddy, Larry Steur, on Desha Road, Lexington. Burglary occured in broad daylight, while Larry was inside. Please help Larry recover his stolen bicycle, no questions asked. Do you have information about this stolen bicycle? Contact Larry at @runlarryrun on Twitter, or by email at stolenbike@larrysteur.com, and help him get his bike back. I had forgotten about this page, until I wrote an article about bicycles today. Larry died in 2011, while we were walking. He never found this bicycle.